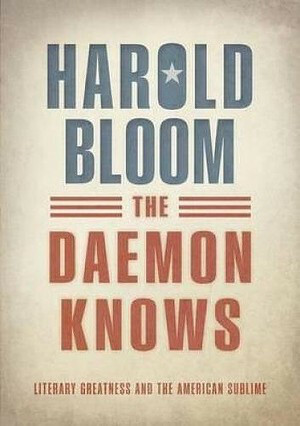 The Daemon Knows is an exploration of what Bloom calls the “American sublime”: that class of literature that reaches beyond the human, in a way that is distinctly American. What is beyond the human falls, by Bloom’s estimation, into three major categories; God, Nature, and the Daemon, and it is the last of these that Bloom is concerned with. What connects the twelve works that Bloom has chosen is what he calls, ‘their receptivity to daemonic influx.’ But what is the daemon? It is Emerson’s “God within,” the ‘American self’, the genius, the muse, that spark of the individual that transcends the everyday. ambivalence has to mark the American Sublime: Think of Melville, Whitman, Eliot’s The Waste Land, Faulkner’s doomed landscapes. A selfhood endlessly aspiring to freedom from the past is bound to resist actual overdeterminations that bind us all in time. The daemon of the American sublime is the very daemon that both haunts and yet makes possible the American Dream itself; a sense of striving fated never to succeed. It is this very essence that Bloom seeks to distil from the works he considers. The authors Bloom selects for his study are considered in roughly chronological pairings, which are often left to bleed into one another. In his mid-eighties, the great critic has brought a lifetime of reading and thinking about authors from Herman Melville and Walt Whitman to T.S Eliot and Wallace Stevens, into one very personal volume. The personal tone of The Daemon Knows, with its anecdotes, opinions, and autobiographical details, creates an unexpected degree of intimacy in the reading. As a critic, Bloom’s confident style has always maintained the capacity to meander into sweeping largesse and generalised pronouncements. In this more intimate volume, there is perhaps a step back from the outright didacticism of some of his preceding works into a more humble stance, and a slightly more personable style. In this volume, Bloom concedes that: ‘We do not read only as aesthetes – though we should – but also as responsible men and women.’ In accepting the subjectivity of his own reading experience, albeit a little grudgingly, there is a greater sense of openness to the book in general, and subsequently more room for the emotion that must form the bedrock of the sublime for a reader. Bloom’s love of Hart Crane, in particular, is at times quite moving. As well as the personal elements, the breadth of Bloom’s knowledge, and his ability to select and deploy the most exquisite quotes, makes this book an absolute joy to read. My personal familiarity with American Literature does not extend to all of the major writers in this book, but where I was less familiar, my interest was piqued, and where I held some small expertise, my appreciation was deepened. In many ways, this style of criticism harks back to the expansive ebullitions of critics like Sir Arthur Quiller-Couch–a style that is certainly not to everyone’s taste. But for a general audience, with an interest in getting to know some of the great writers of American literary history, this book, from one of the most renowned critics of his generation, makes a wonderful introduction.